In the first of this two-part series we started testing a group of 10 second-hand OE pumps suitable for Do-It-Yourself IC water spray set-ups. Now it’s time to check out the remaining pumps, summarise the results and name our winner! This is the first European pump of the test – and it’s a good ‘un. The old Mercedes pump aces many of its younger rivals by generating 34 psi maximum outlet pressure (while connected to a Spraying Systems nozzle and operating at our 14.2V test voltage). Slogging away at 34 psi, this pump flows 225ml of water per minute. Peak current draw is 5.5 amps on start-up and 3.1 amps continuous. Manufactured by Hella, this old-school looking pump is around 70mm tall and 30mm diameter. The inlet and outlet fittings are both 6.5mm OD – the inlet fitting is on the end. A good, solid pump that offers better than average performance. The large body Volvo pump looks like it’ll offer serious performance. But does it deliver? Well, yes, this is another good pump – but it’s certainly not the greatest. Operating at 14.2 volts and working with the Spraying Systems nozzle, our particular pump sounded a bit strained and showed output pressure fluctuations – between 30 and 34 psi. Running at maximum pressure, this pump flows water at a rate of 205ml per minute. Note that this particular pump took a moment to build up to maximum water pressure. This probably explains why it didn’t take a big gulp of current on start-up – it draws 3.4 amps from the moment you switch it on. Manufactured by VDO, this pump is well-suited to ‘remote mounting’ applications thanks to its sturdy mounting bracket. A pair of 6mm OD hose fittings is arranged side-by-side at the front of the pump. The main body of the unit is 26mm diameter and around 84mm tall. Not a bad choice if you want to mount the pump separately to the water reservoir. You might be able to find one that offers more consistent performance than the unit tested here. Our expectation that all 4WD vehicles use a high pressure/high flow windscreen washer pump was dismissed with the Holden Jackaroo unit. Hooked up to our test nozzle, the Jackaroo pump maxes out with an output pressure of 27 psi – less than a garden-variety Magna or Hyundai pump. Operating at full pressure for a minute it consumes just 175ml of water. The peak current draw is 4.2 amps on start-up, settling back to 1.9 amps. Note that, despite its rusty appearance, our Jackaroo pump sounded fine during tests – these are representative pressure and flow figures. 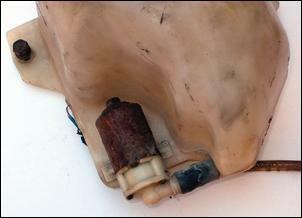 The unit’s rusted appearance is a give-away that it uses a metal housing. Its overall dimensions are 66mm tall and 30mm diameter, while the inlet and output fittings are 10mm and 5mm OD respectively. The Rambler Rebel pump looks and performs like the Holden Jackaroo pump – so it’s nothing more than mediocre. 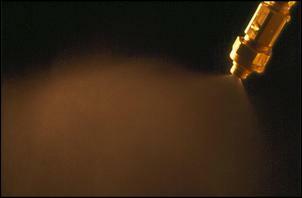 Connected to the Spraying Systems nozzle, the Rebel pump generates a maximum output pressure of 26 psi. This gives a water flow rate of 170ml per minute. Start-up current draw is 3.8 amps while the continuous draw is 2.1 amps. The biggest difference to the Jackaroo pump is the Rambler’s large diameter inlet fitting and different on-tank mounting arrangement. 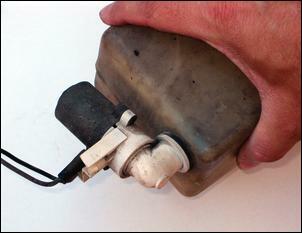 The Rebel pump is mounted to the washer bottle using a threaded fitting fastened from the inside of the tank. The inlet and outlet fittings measure 17 and 5mm OD respectively and the pump body is 58mm tall and 29mm diameter. Note that the Rambler Rebel’s windscreen washer pump and bottle appears to be the same as fitted to certain 1970s Chrysler models. But there’s no reason to go chasing it. This is truly the big-banger of the group. We’re told that this pump is part of the headlight washer system that was fitted to the Japanese-market Nissan Terano 4WD (aka Pathfinder). With a body measuring 140mm tall and 57mm diameter, the Terano headlight washer pump is one serious bit of gear – much bigger than the other pumps. The water inlet fitting is 8mm OD and the outlet is 5.5mm OD. Connected to the Spraying Systems nozzle and operating at 14.2 volts, the Terano pump generates a massive 55 psi output pressure. And, as you can imagine, the water spray from the nozzle is beautifully atomised! Running at 55 psi, this pump has a water flow rate of 290ml per minute – so you’ll likely need a large capacity water reservoir. Compared to the windscreen washer pumps, the Terrano headlight washer pump generates considerably more noise and vibration. As a result, this unit is factory equipped with rubber insulators on the mounting bracket to help reduce the amount of vibration transmitted to the vehicle body. Keep this in mind when you mount it in your car. With such tremendous output, the Terano pump consumes a lot more power than its windscreen washing rivals. Peak current draw on start-up is 12.5 amps, while it draws 6.7 amps continuously. It’s no wonder this unit has meaty power and earth wires! 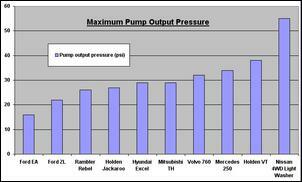 This graph shows the maximum output pressure for each pump (click on it to enlarge). 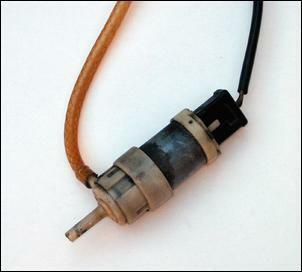 As you can see, the maximum pressure for the majority of windscreen washer pumps is in the vicinity of 20 – 30 psi. Only the woeful Ford EA pump falls short of generating 20 psi. 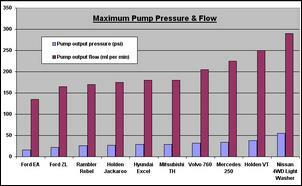 However, at the ‘business end’ of the graph there are 4 pumps that generate in excess of 30 psi output pressure – the Volvo, Mercedes, VT Commodore and Terano units. The two European pumps are a fairly close match but the Holden VT Commodore pump is streets ahead with a maximum output pressure of 38 psi. That’s a huge 137 percent advantage over the lowest performing EA pump! But the most eye-catching performer is the Nissan Terano headlight washer pump. Generating a maximum output pressure of 55 psi, this monster delivers 244 percent greater pressure than the EA Falcon clunker. Stunning! Our test reveals some clear winners. 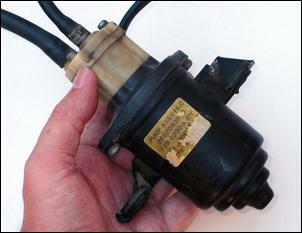 The Holden VT Commodore windscreen washer pump is Number 1 amongst its rivals. It offers the best performance in its class, it's relatively new, is readily available and fits into a typical late-model washer bottle. You can’t go wrong. The Mercedes and Volvo pumps also deserve a mention. These units offer less performance than the VT pump but might be better suited to custom installations not using a late-model washer bottle. Be aware that the performance of these pumps may vary from example to example – these are old. 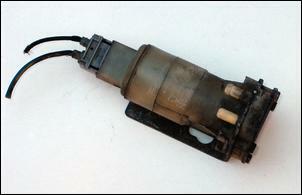 Well, for huge water flow and pressure you can’t go past a headlight washer pump, such as fitted to the Nissan Terano. With an outlet pressure of 55 psi, its right up there with the pump used in ‘upmarket’ intercooler spray set-ups. Note that a headlight washer pump – such as the Terano unit – will be more difficult to source and will vary even more in price. Go drive yourself a bargain!